Act quickly if a dispute arises or risk serious consequences. This article appeared in the March 2016 issue of Club Life. Like all organisations clubs need to regularly review their offerings to ensure they stay relevant and meet members’ expectations. For many clubs, this means a revamp or renovation. Whether it is a new foyer, auditorium or a whole new venue, clubs must act quickly if a dispute arises with a builder. Unfortunately for clubs, the Building and Construction Industry Security of Payment Act 1999 (NSW) (Act) provides very tight deadlines if a dispute between a club and a builder occurs over payment and that Act overrides the provision of the building contract. Of course, while many issues can during building work, failure to adhere to the time stipulations under the Act can have severe consequences for clubs. 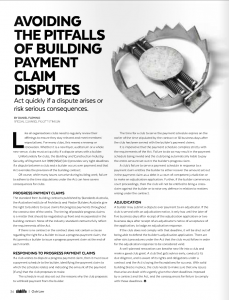 The standard form building contracts published by Standards Australia, the Australian Institute of Architects and Master Builders Australia give the right to builders to issue claims for progress payments throughout the construction of the works. The timing of possible progress claims is a matter that should be negotiated up front and incorporated in the building contract. None of the industry standard contracts fully reflect the requirements of the Act. If there is no contract or the contract does not contain a clause regarding the right for a builder to issue a progress payment claim, the Act permits a builder to issue a progress payment claim at the end of each month. If a club wishes to dispute a progress payment claim, then it must issue a payment schedule to the builder, identifying the payment claim to which the schedule relates and indicating the amount of the payment (if any) that the club proposes to make. The schedule must also set out the reasons why the club proposes to withhold payment from the builder. The time for a club to serve the payment schedule expires on the earlier of the time stipulated by the contract or 10 business days after the club has been served with the builder’s payment claims. It is imperative that the payment schedule comply strictly with the requirements of the Act. 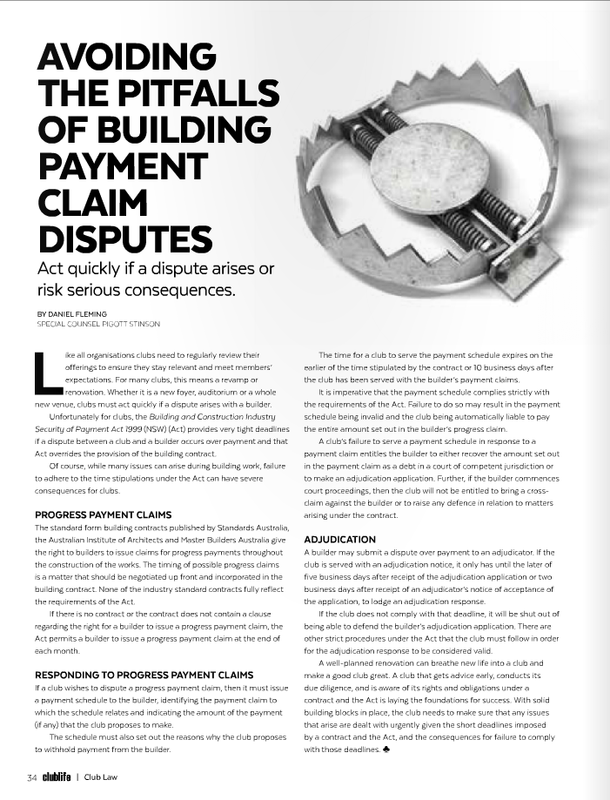 Failure to do so may result in the payment schedule being invalid and the club being automatically liable to pay the entire amount set out in the builder’s progress claim. A club’s failure to serve a payment schedule in response to a payment claim entitles the builder to either recover the amount set out in the payment claim as a debt in a court of competent jurisdiction or to make an adjudication application. Further, if the builder commences court proceedings, then the club will not be entitled to bring a cross-claim against the builder or to raise any defence in relation to matters arising under the contract. A builder may submit a dispute over payment to an adjudicator. If the club is served with an adjudication notice, it only has until the later of five business days after receipt of the adjudication application or two business days after receipt of an adjudicator’s notice of acceptance of the application, to lodge an adjudication response. If the club does not comply with that deadline, it will be shut out of being able to defend the builder’s adjudication application. There are other strict procedures under the Act that the club must follow in order for the adjudication response to be considered valid. A well-planned renovation can breathe new life into a club and make a good club great. A club that gets advice early, conducts its due diligence, and is aware of its rights and obligations under a contract and the Act is laying the foundations for success. With solid building blocks in place, the club needs to make sure that any issues that arise are dealt with urgently given the short deadlines imposed by a contract and the Act, and the consequences for failure to comply with those deadlines. Click on the image below to see the article as it appeared in Club Life March 2016.